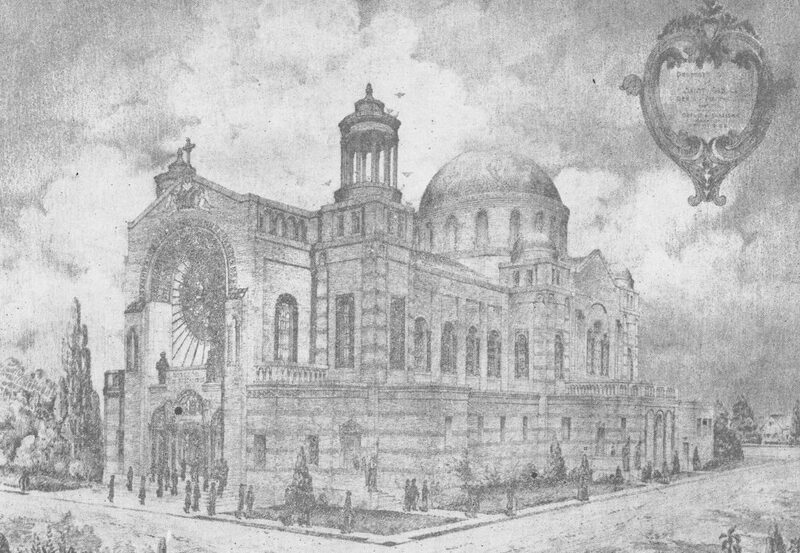 The fourth Polish church in Buffalo, St. Casimir’s, would have a profound effect on not only the Poles, but the city, and the history of Catholicism in Western New York. In the late 1880s, Poles began settling near Clinton and South Ogden having found work in the area. In 1890, 40 Polish families petitioned the bishop to establish a church to meet their religious needs. The bishop agreed and on November 16, 1890, St. Casimir’s Church was dedicated on land donated by City Court Judge Daniel J. Kenefick. It would be from anglicization of the Polish name of the church, Kazimierzowo, that the neighborhood would become known as Kaisertown. The first church, a large wooden structure, colloquially known as Noah’s Ark, served as the church, school, and rectory. In its first 10 years the parish grew, despite a high turnover of priests with many of them commuting from St. Stanislaus. It was with the appointment of Father Kasprzak in 1900 that stability was brought to the now bustling church. 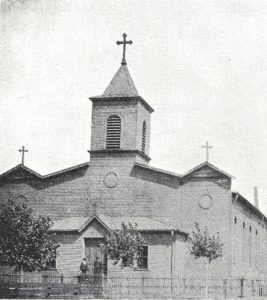 In 1903, there were 1,200 parishioners with 93 students in the school and plans were soon begun to build a new parish building. The three-story, brick combination school and church structure was completed in 1908 at a cost of $78,000. Following Father Kasprzak, a number of priests served at St Casimir’s with two of them having a lasting impact on the area. Both Father Stabenau and Father Anthony Majewski worked to have the streets of Kaisertown paved, knowing that the growth of the area depended on it. Father Majewski would also be responsible for other street improvements and flood mitigation of the Buffalo River after a number of children drowned, but the priest’s lasting legacy would be a new church. 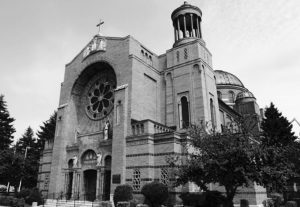 In 1926, at the behest of the chancery, Father Anthony began looking into a new church building for St. Casimir’s. Inspired by the churches he saw in Europe, Majewski hired architect Chester Oakley to design a Byzantine-style church reminiscent of the Hagia Sophia in Istanbul, Turkey. A young Joseph E. Fronczak, then an associate architect with Oakley, was charged with much of the detailing of the building. The stained glass was imported from Mayer of Munich in Germany while Buffalo artist Joseph C. Mazur was hired to paint the murals. The total cost of the project was $450,000. Father Anthony Majewski guided the parish through the Great Depression and World War II until his death in 1955. One of the most important events in St. Casimir’s history occurred August 17, 1976, when future Pope and Saint, John Paul the Great celebrated a Mass in the church. Part of a tour of the United States with 17 Polish Bishops, the then Cardinal Wojtyla spent the night in the parish rectory, which in 2014 was made into a Papal Prayer Room in his honor. A Memorial Book Commemorating 85th Jubilee of Saint Casimir's Parish, Buffalo, New York, 1890-1975. Buffalo, NY: Rainbow, 1975. Print. Album Pamiatkowe I Przewodnik Handlowy: Osady Polskiej W Miescie Buffalo, Z Dolaczeniem Okolicznych Miejscowosci Ze Stanu New York. Buffalo, 1906. Print. Ederer, Martin F. Buffalo's Catholic Churches: Ethnic Communities and the Architectural Legacy: An Illustrated History. Buffalo, NY: Digital@batesjackson LLC, 2003. Print. "Host Parishes Are Listed For Bishops' Visit." Am-Pol Eagle [Buffalo, New York] 5 Aug. 1976: 4. Print. "Kaisertown another Loss?" Kaisertown Another Loss? Am-Pol Eagle, n.d. Web. 20 Dec. 2015. Kearns, Michelle. "St. Casimir’s Catholic Church Will Open to the Public a Room Where the Future Pope John Paul II Once Slept A Room with a View to the Past, Ties to a Saint - The Buffalo News."Www.buffalonews.com. Buffalo News, 27 Apr. 2014. Web. 20 Dec. 2015. Napora, James. "SAINT CASIMIR'S ROMAN CATHOLIC CHURCH - 1927. "Buffalo Architecture and History. Chuck LaChiusa, 1995. Web. 20 Dec. 2015. Pamiȩtnik Złotego Jubileuszu Kościoła Św. Kazimierza, Buffalo, N.Y., 1850-1940. Buffalo, NY: Druk Dziennika Dla Wszystkich, 1940. Print. "Polonia Extends Warm Welcome to Polish Hierarchy." Am-Pol Eagle[Buffalo, NY] 19 Aug. 1976: 1-4. Print. Status of Parish Mergers (announced May 31, 2008). Rep. Buffalo, NY: Diocese of Buffalo, 2015. Print. Warren, Lucian C. "Buffalo's Poles Enrich City With Music, Art." Buffalo Courier-Express [Buffalo, NY] 19 Jan. 1941, Five sec. : 2. Print. Wysocki, Ted. "Celebration Marks Opening Of Clinton St." Buffalo Courier-Express [Buffalo, NY] 1 Nov. 1950: n. pag. Print.